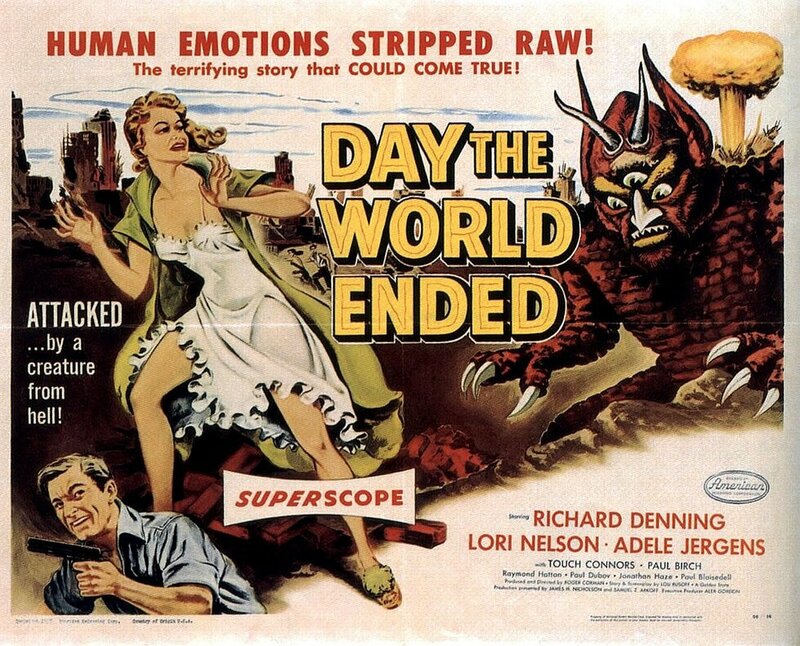 This is the fourth film directed by schlockmaster Roger Corman and his first foray into the genres that would come to define his career: horror & science-fiction. As this movie begins, the atomic bombs have been dropped and seven people and one donkey find themselves huddled together in a home that was protected from the radiation poisoning by lead lined canyon walls around it. There’s the handsome geologist, Rick; overprotective survivalist Jim and his beautiful daughter, Louise; there’s Tony, a small-time mobster; Ruby, a retired striptease dancer; Pete, a Walter Brennan style-esque 1800s style prospector who seems to have wandered in from a time portal or something (he’s the one who brings the donkey); and Radek, a mysterious man who is suffering from a strange malady because of the radiation. Of course, Radek is soon sneaking out of the house and eating rabbits raw. Tony & Rick start competing for the alpha role. Jim decides it’s imperative that one of them impregnate Louise as soon as possible, though, of course, only after he, a retired ship captain, performs a legal, binding marriage. And a monstrous figure starts rustling through the bushes. For all that, this movie is actually pretty dull. This is maybe mostly because none of the performers are very good, mostly just coming across as bland. Adele Jergens is an exception as the ex-stripper Ruby. There’s one really great scene where she puts on a record and gets lost in her memories that is really, really good. She absolutely nails a whole range of emotions. And, in the so-bad-it’s-good category, there is one absolutely hilarious fist-fight between Rick & Tony where the two seem dedicated less to beating each other up and more to destroying every piece of furniture in the room. When the monster finally arrives, it’s a truly hideously bad costume. And the film goes for a War of the Worlds type ending by having the monster killed by a rainstorm. “It evolved to survive a poisoned world,” Rick muses, “So it was killed by something pure.” Well, at least we know why you’re not a biologist. Anyway, it is what it is. 1 stars. tl;dr – schlocky post-apocalyptic film has the occasional moment of potential, but is mainly a bland affair. 1 star.